aerospace, medical, prosthetic, motorsports, semiconductor and outdoor recreation markets. When specified on a 2A|MACHINE Purchase Order, the requirements, as stated below, become a part of the purchase order issued by 2A|MACHINE. It is important to comply with these SQRs to avoid rejection of, and/or delay in, payment for material supplied under the purchase order issued. 2A|MACHINE requires approval of product, qualification of personnel, process and equipment usage for special processes. The identification and revision status of specifications, drawings, process requirements, inspection/verification instructions and other relevant technical data. Requirements for design, test, inspection, verification (including production process verification), use of statistical techniques for product acceptance, and related instructions for acceptance by 2A|MACHINE, and as applicable critical items including key characteristics. Requirements for test specimens (e.g., production method, number, storage conditions) for design approval, inspection/verification, investigation or auditing. By acceptance of this purchase order, the subcontractor grants to 2A|MACHINE, its customer, their customer and/or applicable regulatory agency, the right-of-entry for the purpose of examining work, materials, and records to insure conformance to contractual requirements. The supplier shall flow down this requirement to their sub-tiers. The process specification(s) indicated on our purchase order requires prior approval of your facility by our customer. Notify our Purchasing Department immediately if you are not an approved supplier or if there has been a change in your approval status. The supplier shall furnish a copy of the completed final acceptance dimensional inspection report, along with actual measurement data and Quality Control acceptance stamps/buyoff evidence, for each shipment of each item listed on the purchase order. 2A|MACHINE part number and Revision. A reference to all applicable specifications as listed on P.O. or drawings. Quantity and U/M of items shipped. Name and address of manufacturer/processor. The ORIGINAL signature of an authorized company representative. The name of the producing company. The material specification and revision level. The raw material heat/lot number. The actual quantitative results of all lot acceptance testing as required by the raw material specification (i.e. – chemical, physical, and metallurgical). The ORIGINAL signature of an authorized mill, laboratory, or distributor representative. When specified on individual Purchase Orders, 2A|MACHINE requires the supplier to notify 2A|MACHINE of any changes to supplier’s manufacturing facility, product, processes, raw material suppliers or services. When specified on individual Purchase Orders, 2A|MACHINE requires the supplier to flow down to sub-tier suppliers the applicable requirements in the Purchase Order, including any key characteristics. Any deviation to 2A|MACHINE requirements or known delivery of nonconforming product as set forth in Purchase Order shall be documented and submitted to 2A|MACHINE for disposition prior to product shipment from supplier’s facility. The supplier is prohibited from subcontracting any portion of the work to be performed in the performance of this contract, without written 2A|MACHINE authorization. The supplier shall maintain records of manufacturing, inspection, testing and traceability used in the performance of the contract. Records shall be maintained, in the appropriate medium, for a period not less than 7 years after the completion of the contract. Upon completion of the order and prior to shipment, notify 2A|MACHINE Purchasing Department so that arrangements can be made for a Quality Representative from 2A|MACHINE to visit your facility and perform a source inspection. A written acceptance by 2A|MACHINE of the first article produced or processed against this purchase order is required. 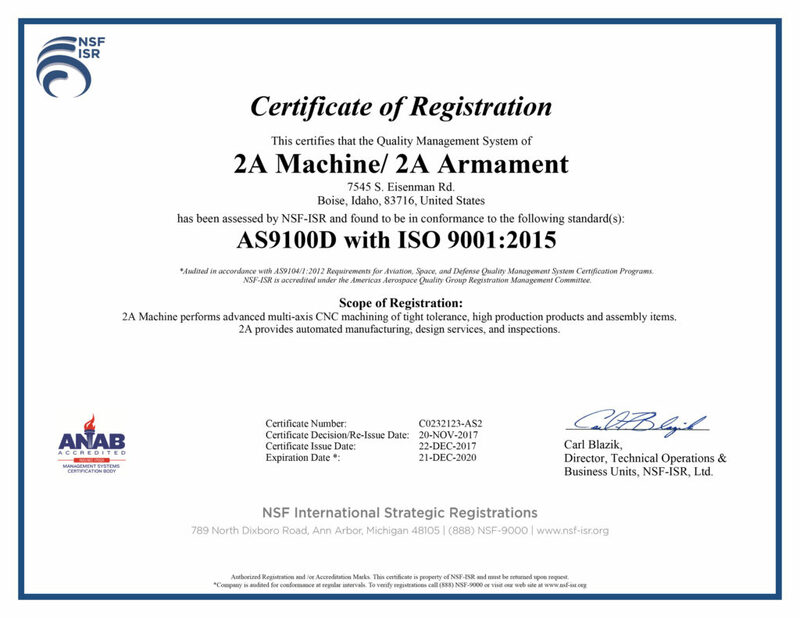 The supplier must furnish to 2A|MACHINE a first article item for approval, along with a completed first article inspection dimensional acceptance report and all necessary verifiable certifications and test reports required by this purchase order – prior to the commencement of any further production. Items manufactured under the purchase order agreement shall be fabricated from 2A|MACHINE furnished material intended for the completion of this order only. The supplier shall not substitute, rework, or dispose of 2A|MACHINE furnished material in any way, except as allowed for or instructed to do so in writing. Unused material must remain properly identified and returned with the last shipment of fabricated parts, unless instructed otherwise. Special process suppliers are responsible for compliance to the applicable specifications, including customer special process approval, whether the operation is performed within their facility or not. The metrology subcontractor shall provide and maintain a calibration system that meets at least one of the following requirements, as currently amended, in the performance of the contract.